I wrote about this subject a while back, but it is so important I thought we’d visit it again. A little while back I listened to someone talking, and I was left bothered for days. I couldn’t figure out what it was, but I was really disturbed by the things the individual was saying. I could not shake how I felt. After a time of thinking and praying about it, I realized what it was that bothered me; Love. It was love and how we, believers, miss its mark without even recognizing it. It is so easy to talk about love, but it is not so easy to actually walk in it when it comes to bestowing it upon other people. Yes, we all want love; however, we often withhold it from others. This is very true amongst church folks. After listening to this individual talk about another believer who annoyed them, my heart was heavy. As I thought about God’s instructions to us about bestowing mercy on others, loving others, esteeming others highly, and overlooking offences I realized that many church folks ignore the meat of these passages. We do not take them seriously; we do not obey them when it really counts. It is a perfect place for self-examination, so let’s take another look at what God has to say about it. In light of this definition, we must ask ourselves if we truly show mercy to others. The Bible does not give us a pass for difficult people or those who annoy us with their ways/actions. James tells us that if we do not show mercy to others then we will be judged without mercy. Let me ask you something. Where would you (we) be without God’s mercy? What would judgment be like if God withheld His mercy from us the way we withhold it from others? What if God would not forgive our foibles, our flaws and weaknesses that displease Him? What if He were as hard on us as we are on others? Something to think about isn’t it? Believers are to extend love to others. Love…that word that we toss around so carelessly. That word we use to describe how we feel about something as simple as a favorite color. Love, a serious word whose true definition often escapes us. To know if we are truly extending love to others we must use God’s definition as our measuring stick. Take a look at this brief breakdown of what the Bible tells us love is. Now, when I look at this I recognize that, in some ways, I must come up to meet God’s standards. I know for a fact I’m not the only one. I cannot begin to tell you how many times I have heard believers complaining about one another! This one is annoyed with that one. This one is always irritated with another one. I have actually heard professing believers say that they “don’t give the benefit of the doubt.” This one doesn’t like the way one said this, and that one doesn’t like the way this one handles that! There are even some professing believers who need to examine how they view and treat their parents. 1 Corinthians 13:4-6 lets us know this kind of behavior is not love. The truth is that many of us aren’t bearing or enduring anything. We are not hoping or believing for improvement in our fellowman, especially of the household of faith. We are too impatient and too easily irritated with others. Some of us even believe ourselves to be better than others. We do not love people. Believers have no business being haughty, losing patience, being easily irritated, yammering about an individual’s faults and weaknesses to others etc…. If our thoughts, words, and actions are not lining up with Scripture then we are not showing love; if we aren’t showing love then what are we showing? Hmmm, something to think about isn’t it!? Jesus commanded us to love (John 13:34-35; John15:12,17), but it is obviously something that doesn’t necessarily come easy to human beings. What we must remember is that God equips us to do what He has told us to do. The question is whether or not we want to obey Him. If we do, here are some steps we can take to become people who obey God in loving others. 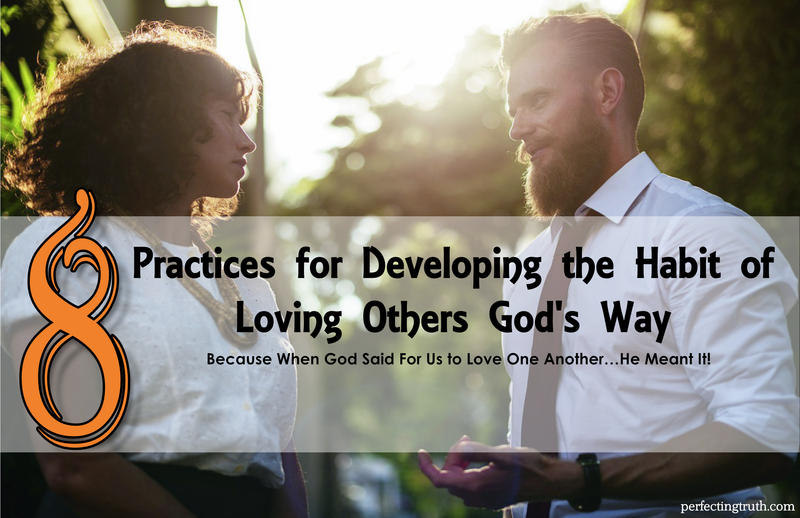 Develop a habit of loving others God’s way through practice! It is high time we, believers, get more serious about actually living our faith. That starts by reading the word and actually obeying what it says. When the Lord said for us to love one another, He meant it. We have to examine ourselves in light of what He says love is; we don’t get to define it. I challenge every believer, myself included, to practice loving the way the Bible says for us to. Love those difficult personalities in our lives; love those that our flesh tells us not to like. Actively love our fellow believers, our fellowman. Let us put our actions where our mouth is. Oh what a testimony we will have! What are your thoughts on the subject of love? Ah, what an inspiring and convicting message you share- and in perfect time for the Holidays where we can be surrounded by people who we deem ‘unlovable’. I love this. Thank you for being bold and challenging us to love as God calls us to love. It’s a shame there are believers who are bad examples for those who do not know the Lord. I have seen it too- and if I were to be totally honest- I am guilty as well. We can all do better. We must. There is always room for improvement, and God is so wonderful to bring to light our areas of need. Thank you for stopping by/reading the post. I am happy you found it beneficial. I have been debating whether to wish a friend I sorta fell out with happy Birthday on their birthday which is coming soon but I have decided that I will call them. Because God is graceful to me so why shouldn’t I be graceful to Him. Yes!! Love in action my friend, love in action :). You may be surprised at what this gesture accomplishes in both your lives. The day I accepted that I also have faults is the day I began to love and appreciate people more than I did before. I know someone somewhere does not like me for some reason but has learned to accommodate me the way I am, so why can’t I do the same? It has freed my life from unnecessary anger and granted me so much patience when dealing with people; of course with the strength and wisdom of our God above. That is wonderful! Your words are so true. We are all flawed in some way, we all have faults. We all need understanding, forgiveness, compassion, and love; therefore, we should be more than willing to bestow this on others. Thanks for taking time to read the post and share your thougts. I would almost like to hang a sign around all humans necks that simply says “precious child of God” so I could always remember. I am irritated too easily. I understand what you mean. A positive here is that it’s a blessing to recognize easy irritation within ourselves. I know some who don’t see a need for any kind of personal work. It is always a blessing when we can recognize our own issues and, seriously work on them with the help of the Lord. Thanks for taking time to read this weeks post. These days ‘love’ is proven by specific things that actually have nothing to do with ‘love’. It’s about time: somebody speaks the truth about love and teaches how to walk in it, without ignoring the truth. Amen! Thanks for stopping by. I’m glad you enjoyed the post :). I totally agree with you. Sadly, I don’t think the majority of us (in the world and in the church) truly know/understand the meaning of love. It is so true what you say. It saddens my heart as well to see how we lack love within the church. And yet Jesus said that was how the world would know we were of Jesus. I wonder why we have forgotten that. I think it is because the world has misinterpreted the meaning of love and we have fallen for it. We think love is a feeling but it is a choice. Thanks for stopping by. I agree, love is a choice and not a feeling. To think of love in terms of feeling reduces it to just a shallow term, removing any accountability/integrity from it. Just look at how the world thinks. They “fall” in love and out of “love”, irregardless of commitments made -supposedly- before God and man; vows are kept or broken based on fickle feelings.Feelings can and will get us into trouble. Like you said, we have fallen for the world’s errant meaning of love. As a matter of fact the church has fallen for a lot of what the world pushes as right. With everything we pick up we get further from what the Lord has called us to be. So many thoughts on this. I remember a missionary once sharing a message with our congregation that we need to show MORE love to our brothers in the congregation, instead of picking at each other’s faults. You said it perfectly, Jesus said to love…period. Such a beautiful article. Thanks for reading the post and sharing your thoughts. Can you imagine what would happen if those of the household of faith loved one another as Christ commanded? Can you imagine what a witness to the world that would be, how many would be compelled to come to the Lord from that alone? How awesome it would be! Thanks so much for taking time to read the post. I am thrilled that you enjoyed it and found it helpful.